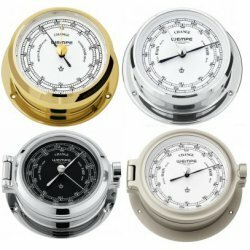 WEMPE barometers precisely measure the atmospheric pressure and a pleasure to look at. The literal translation from ancient Greek indicated that we're actually dealing with a weight-meter. Centuries ago, scientists already wondered how it would be possible to most accurately measure atmospheric pressure. Their solution was a weather-glass in the shape of a beaked jug, filled with a liquid whose level rose or fell depending on the atmospheric pressure. The Dutch used a type of early barometer in the 17th century that was used to forecast changes in weather. The modern WEMPE barometers reliably predict the weather of the following one or two days. They re available in many different designs - every product series of WEMPE chronometers impresses with its very own look - always made to highest quality standards, easy to open, and decorative on land and at sea.